The essential condition for a biomaterial to bond to the living bone is the formation of a biologically active bonelike apatite on its surface. In the present work, it has been demonstrated that chemical treatment can be used to create a calcium phosphate (CaP) surface layer, which might provide the alkali treated Nb metal with bone-bonding capability. Soaking Nb samples in 0.5 M NaOH, at 25 °C for 24 h produced a nano-porous ∼40 nm thick amorphous sodium niobate hydrogel layer on their surface. Immersion in a simulated body fluid (SBF) lead to the deposition of an amorphous calcium phosphate layer on the alkali treated Nb. The formation of calcium phosphate is assumed to be a result of the local pH increase caused by the cathodic reaction of oxygen reduction on the finely porous surface of the alkali-treated metal. The local rise in pH increased the ionic activity product of hydroxyapatite and lead to the precipitation of CaP from SBF that was already supersaturated with respect to the apatite. The formation of a similar CaP layer upon implantation of alkali treated Nb into the human body should promote the bonding of the implant to the surrounding bone. 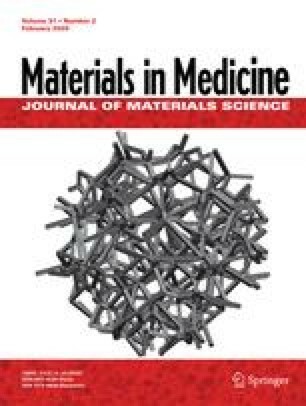 This bone bonding capability could make Nb metal an attractive material for hard tissue replacements.